The fourth and last movement of a symphony is usually called the Finale. It is usually the most exciting movement because it is the culmination of the opus; a closure of the composer’s singular intention, developed over the first three diverse movements, containing numerous themes and motifs. The Whole Life Worship paradigm operates in the same way: The fourth movement, Worship in the Congregation, culminates the weeklong journey of receiving from and responding to God in the contexts of solitude, marketplace, and spiritual friendship. Here, the Whole Life Worshiper joins other worshipers in the corporate expression of praise and thanksgiving to God. There is something wonderful, powerful and dynamic when God’s people gather together to praise their God for who He is and what He has done. Almost all Christians engage in weekly congregational worship (although an alarming and increasing number of Christians do not attend a local church on a regular basis – another topic we’ll hit at a later date). What makes the Whole Life Worship paradigm different than how many Christians view congregational worship is that Worship in the Congregation is seen as the culminating movement of worshiping God. 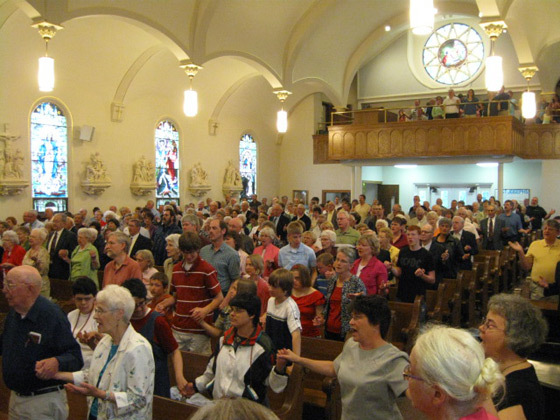 For many, the congregational gathering is their first (and perhaps only) movement of worship. As a result, the worship service is seen as the spiritual “vitamin” that one takes to help them cope with their week of non-church and non-worship. This wrongly places the onus on the worship service itself to provide what Christian consumers want for their spiritual pill: inspiring songs (in the style of their preference and at the right volume level), motivating sermons, state-of-the art videos, award winning choirs or musical soloists, ambience in lighting and staging. And many churches are happy to oblige their customers. Even traditional and liturgical churches struggle with the “consumer-orientation” of Christian congregants. In spite of the noble effort of Matt Redman who wrote that worship is not about us but about Jesus (“The Heart of Worship”), churches and church goers find themselves in the “rat race” of trying to have their “worship experience” expectations met. It becomes all about us, and little to do with Jesus. However, if Christians had a Whole Life Worship mentality, I believe things would be different. Whole Life Worship says, “Instead of improving the worship service, why not improve the worshiper?” When a person encounters God throughout the week (in personal worship, in the everyday ordinary, and in spiritual friendship), they come to the congregational gathering ready to “give” to God, instead of hungry to “get” something out of the service. Congregational worship would not be the “bread and butter” of their worship, but the “frosting on the cake.” It is an opportunity for overflow, where the life of God oozes out of one life and into another. I’ve taught Whole Life Worship to several people at my church and their attitude toward congregational worship is markedly different than others. They come with hearts full of praise and thanksgiving to God. They engage with the songs as opportunities to honor the God who has revealed Himself throughout their week (even if they don’t care for the song!) They seem to be more full of joy and exuberance in their worship. They listen to the message with a sense of expectation because they know God will speak to them, as He did on the weekdays. They are more alert and sensitive to the needs of people around them; often ministering to others who are downtrodden or discouraged. The reason for the difference is that they come to Congregational worship already “full” of Jesus, the love of the Father, and the empowerment of the Spirit. I dream about it all the time. Maybe you’re dreaming the same thing. It can happen. As I read in Acts, it has happened before. And as I read in Revelation, it will happen again; in fact, it is the destiny of the Church of Jesus Christ. But I don’t want to wait until “Kingdom come” to start worshiping God the way He wants me to worship – with my whole life. We can start today, right now. How about it? 1. How do you prepare for congregational worship? 2. What are some ways you can encourage others in the congregation as you worship together? I love the illustration “frosting on the cake”. So easy to remember! Sunday Scott said coming to church on Sunday is for a “volcano of praise” not a refill. You’re getting through to us!! !